Met Anna last Saturday in Sinyongsan station. 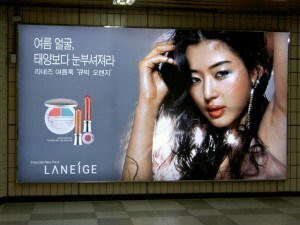 While waiting for her (first time for me), I saw this big Jeon Ji Hyun billboard. It’s not her best image but it’s big :D. I first saw her in the movie “My Sassy Girl (Yeopgijeogin geunyeo)” a few years ago and loved her since then. This afternoon, I was tuned in to YTN Star and saw a feature of Jeon Ji Hyun’s movie with Jung Woo Sung (the second most good looking guy in Korea, after Jang Dong Gun) while they were filming in the Netherlands. I’ll definitely watch out for that movie. i’m also a big fan of Jeon Ji-hyun. i’ve been searching the web for her official website in english. iba talaga ang arrive nya! i’m already 36 pero tumubo pa rin sakin ang pagiging pinoy fan! yuk. Honestly…gusto ko syang pakasalan! ellow jeon,your so very beautyfull lady said my friend and he go to korea to see you only!!! oi pinoy ka rin gusto mo pang pakasalan ha!!! un kaybigan ko nga eh! patay na patay ka jeon pupunta pa sa korea para lang kay jeon ano pah!! natatawa nga kami dun eh! my sassy girl sana ikaw ay mapaskin pagsamo ko sana ay tanggapin mo. One of your greatest fans ever!! Hey jeon, time will come Im gonna visit you in korea,even you are old. elow?jeon ji hyun,mis ka na2min d2 sa korea?bumalik ka na d2 sa atin? muchas grasas el paquito diaz……..that means hello we are your fans here in Antarctica…..
You know what we like ur movie Windstruck and My Sassy Girl………..
yobo seyo jeon ji hyun!!!!!!!!! !anyong hashim nika? i like yo very much……..i like the hyuk jang & jeon ji hyun love team in windstruck!!!!!!! I very love you.You are pretty girl.I ever to meet you in my dream.So I very happy.I wish I meet you. hi!I’m a fan in the philippines. miss ka na namin dito. tagal naman ng hollywood movie mo. di na ko makapaghintay. I so love Jeon Jhi Hyun! she’s so gorgeous!!! hi Jeon ji hyun…sna mpunta ka d2 sa philippines..
cge hanggang d2 nalang po bbye ingatz i’m only 17 year’s old thx…. pls c0me here in philppines! sana makita kita je0n s0on bahala na mamatay na ako bukas basta`t makita lang kita! jarrenas last blog post..Tax break, for foreigners too? sorry napindot ko yung a eh!! jarrens last blog post..Tax break, for foreigners too? hi, to miss jeon ji hyun. I hope na she will have a tour here in Philippines. If that happends please visit me in Caloocan. o pag hindi, I will just visit you there at korea. I really didn’t believe in angel promise until i see you in the movie. tamang tama miss jeon hindi naman malayo ang korea sa pilipinas, pls. visit us here to see all your filipino fans, since i’ve seen some of your movies like Sassy Girl, Windstruck and Daisy your face have stuck up on my mind and i starting for looking and searching more pics. , info about you..thanks and congrats to your career..God bless more! I’m still hoping to see you..very simple beauty..
world’s finest..gudluck to your career idol.. I love you Jeon Ji Hyun! hi,ms.jeon ji hyun! i like the way you act,and i like your personality…you’re such a vicious chic ever!you’re strong and high-spirited one.hope that we’ll see each other,’coz i really want to see you personally…i’m one of your fans now! ‘my sassy girl’. hi jeon ji hyun..ur so beautiful..i love you so much..i hope i can meet you and talk to you someday,,,there something in you that other girls dont have..lâ€¦iâ€™ll go there in south korea someday just to see youâ€¦â€¦goodluck to your career! !i love you my one and only jeon ji hyun!!! ur still no.1 in my heart! !